Cole Hamels completed what Roy Halladay started, putting the Philadelphia Phillies back in the NL championship series. Another ace, another dominating performance. Hamels struck out nine in a five-hitter, Chase Utley homered and the Phillies beat the Reds 2-0 on Sunday night to finish off the franchise's first playoff sweep. Philadelphia, seeking its third consecutive pennant, will host San Francisco or Atlanta in the NLCS opener on Saturday. The Giants beat the Braves 3-2 Sunday to take a 2-1 lead in their division series. Hamels got Joey Votto to ground into a double play after Brandon Phillips' leadoff single in the ninth, then struck out Scott Rolen to end the game. The lanky left-hander threw 119 pitches in his first postseason complete game, 82 for strikes. After Rolen struck out for the eighth time in the series, Hamels pumped his fist and the Phillies celebrated with a few chest bumps and a handshake line before returning to the locker room for more champagne. 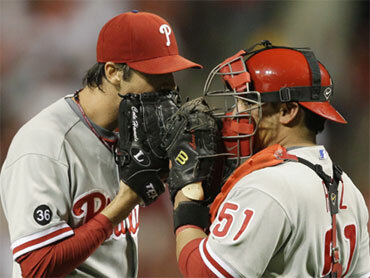 Of course, it all looked very routine - Charlie Manuel's team has practiced this a lot over the past couple of years. Utley, greeted with loud boos and chants of "Cheater! Cheater!" before each at-bat, connected against Johnny Cueto in the fifth, giving the Phillies a 2-0 lead. It was his 10th career postseason homer, moving him past teammate Jayson Werth and into first on the club's career list. Utley started Philadelphia's winning rally in Game 2 when he was hit by a pitch from hard-throwing reliever Aroldis Chapman in the seventh inning. The All-Star second baseman acknowledged after the game he wasn't sure if the ball hit him, and a record crowd of 44,599 at Great American Ball Park made it clear what it thought of the play. Umpires reviewed Utley's drive to right-center to see if a fan interfered with the ball, but the replays were conclusive and the call was quickly upheld. No cheating here. Just another timely drive for the NL East champs. The Reds never regained their footing after Halladay tossed the second no-hitter in postseason history in the series opener. The surprising NL Central winners led 4-0 in Game 2 but quickly fell apart, committing four errors in a gut-wrenching 7-4 loss that put them on the brink of elimination. Hamels took it from there. The 2008 World Series MVP, quite the luxury to have as a No. 3 starter in the postseason, increased his perfect mark against Cincinnati to 7-0 in eight career starts. He also improved to 6-3 in 11 postseason outings. Hamels allowed only two runners to reach second and none of the Reds got to third. He also got some help from his defense in the first when center fielder Shane Victorino sprinted into the gap in left-center to grab Phillips' liner with speedy Drew Stubbs on first. Cincinnati's fielders were not so helpful to Cueto. Shortstop Orlando Cabrera, a late addition to the lineup, made an errant throw in the first that allowed Placido Polanco to score an unearned run, quieting the towel-waving crowd desperate for something to cheer about. Third baseman Scott Rolen mishandled Carlos Ruiz's grounder in the sixth but Homer Bailey got Hamels to fly out to end the inning.